Patek Philippe Nautilus 5712/1A. Steel case diameter 40mm water resistant to 60 meters, screw down crown. Mechanical self winding movement PP Caliber 240 PS IRM C LU. Power reserve of 48 hours. 265 parts. Black-blue dial with gold applied hour markers with luminous coating. Functions: Hours, minutes, second sweep subsidiary, power reserve, date and moon phase display. Brushed and polished steel bracelet. Sapphire crystal case back. Box and papers dated August 2018. SKU: 3034309. 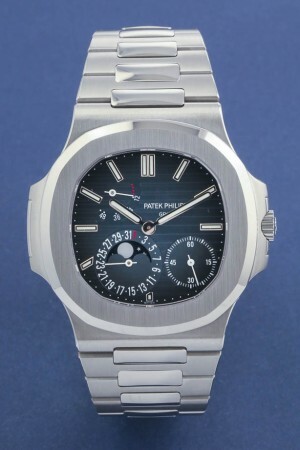 Categories: Nautilus, Patek Philippe.